Peaches are a seasonal fruit that I try to make the most of when they reach their peak. 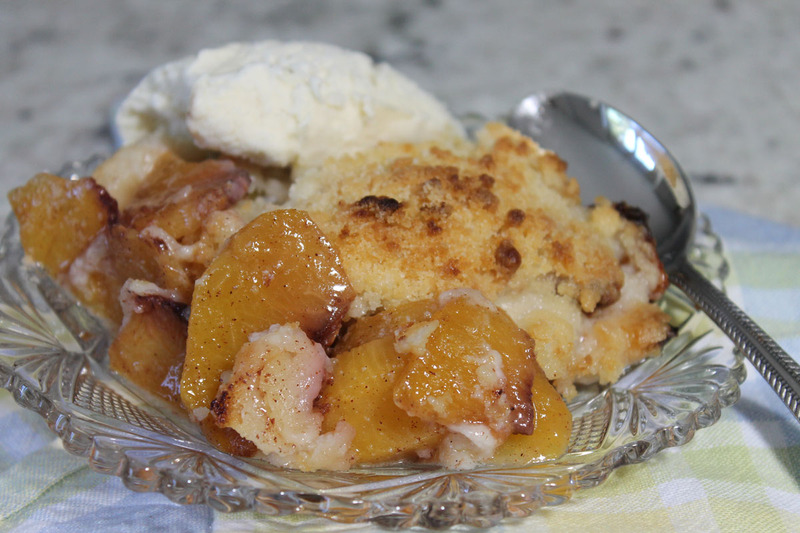 There are beautiful peaches in the market right now so the time is ripe for peach desserts. Fresh peaches are a wonderful fruit to use in desserts like cobblers, pies, and crisps. Today I'm making a fresh peach crisp. My crisp recipe is our family recipe. It differs from most fruit crisp recipes in that the topping is made with sugar, flour, and butter and doesn't have any oatmeal. I don't like oatmeal in my crisp toppings. This fact often causes me to pass on crisps from most restaurant menus. It seems that fruit crisp toppings made with oatmeal are widely popular, just NOT with me. Today's crisp recipe is adapted from my apple crisp recipe. That recipe is the starting point for me for any fruit crisp I make. Any adaptations I make are based on the type of fruit used, the fruit's level of sweetness or tartness and the inherent juiciness of the fruit. Based on those assessments I'll add a little bit more of this, or a little bit less of that. For my peach crisp, I adjusted the sugar, salt, and amount of water. I also added about 1/8 teaspoon of nutmeg to enhance the peach flavor. Nutmeg isn't essential, but it adds a little something special to the crisp. Blanch the peaches in boiling water to make it easier to remove the peel. Boy, oh boy, do I dislike the texture of peach skin in my mouth. I'm very careful to remove every bit of the peach skin. After a minute or two in the boiling water, plunge the peaches into an ice bath to cool. Peel and slice the peaches into a large bowl. My six peaches yielded 8 cups of sliced peaches. Taste your peaches and decided if you will need more or less sugar than the two tablespoons called for. Mix together the sugar, cinnamon, nutmeg and salt. I use this nutmeg grater which I love. Pour the mixture over the peaches and toss to distribute. Pour the water over the fruit and toss again. Pour the fruit into a baking dish. I use a deep dish pie plate. Distribute the fruit evenly. In a medium sized bowl, mix together the sugar, flour, and butter. Now is the time to get your hands into the mixture. Toss and squeeze the mixture together until it forms large crumbles. Be sure all the flour and sugar is incorporated. Distribute the crumble mixture evenly over the peaches. 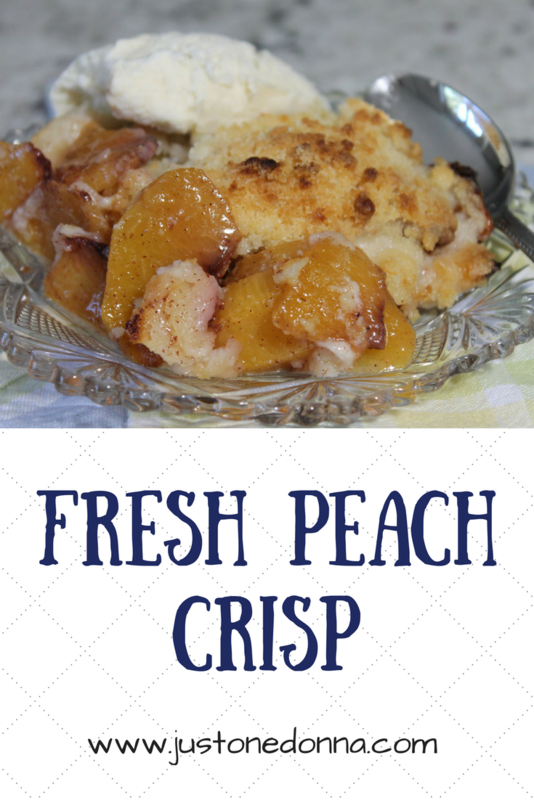 Bake the peach crisp for 45-50 minutes or until the crumble topping is browned and fruit is bubbling. Serve your crisp warm with vanilla ice cream. When my mom was pregnant with me she said all she wanted to eat was peach cobbler. Ever since I can remember anything made with peaches is my favorite type of dessert. When I married my husband it worked out just perfectly that his family owns and operates a peach orchard here in Texas. I can't wait to try this recipe out. I'm going to love it! I love the story about your mom and peaches! I hope you like this recipe. I'd hate to disappoint!